OK, well, I’m not sure how many posts there are going to be – you’ll find out as soon as I figure it out or run out of things to say. As I’m now heading home, I’ll just start writing about the trip and my thoughts on the travel, food and the games. As usual, we’re heading home on Sunday morning. Sure, this means that I miss the last day of the fair – but to be honest, my bags were within 2kg of being filled when I went to bed on Friday night. Not much left to get on Saturday, and there would definitely not be room for anything else come Sunday, even if that’s when the best bargains are to be had. This year, my trip started from a different location. As I mentioned just before leaving, I was in Peoria, Illinois just prior to SPIEL. For the second year running, I have been invited to be a guest at Bradley University for their boardgame design class. Both trips have been amazing experiences, and frankly, I was blown away by the quality of games that these college students have been able to come up with on their own; especially since many of them do not really have any exposure to tabletop games. The game design major offered at Bradley is geared more towards digital games, so this comes as no surprise. It was a great start to the trip, and it definitely got me in the mood to learn more about new games! While we were together on the weekend, Chris and I also decided to finally start being 21st century inhabitants,and we decided that we would try to tweet some of our adventures. That may have cut down a bit on the stuff here on the blog, but we’ll make up for it in the week to come. If you didn’t hear elsewhere – you can probably look at our Twitter feed at @opinionatedgmrs and catch up. (Much of what I posted there will make it into these recaps at some point as well). So, my trip started from Peoria, which is a lovely picture of small town USA. I was amazed by their airport. Security was a breeze – there wasn’t even really any area for a line to form! Also, as we drove in, it was weird to see an airport that had open surface parking for free… That was something I’ve not seen in awhile. Anywho, ended up getting into Duesseldorf on Monday afternoon. I had a hard time understanding the garbled recording, but there was some sort of weather issue (I think they said hurricane) which had caused damage to some of the tracks. As a result, a number of train routes were not coming through the airport station – and they recommended that you take “meow meow meow” instead. Lucky for me, my route was undisturbed, so I could easily identify the train that I wanted; but it was super crowded as everyone hopped onto the train trying to get to the next hauptbahnhof down the line to go somewhere else. Got to Essen in the driving rain, and had to struggle with my two bags about 500m from the U-bahn stop to my first hotel. Nothing was overly wet, and as these things usually go, the rain stopped essentially the minute I stepped foot in the hotel. After getting settled into the Arosa, changed my clothes and headed out for a walk – a very long walk. Generally, on my first day in Europe, I just try to drink a few coffees in the “morning” and then stay on my feet to keep awake until the normal bedtime hours. By then, I’m so tired, jetlag isn’t a problem, and usually I can wake up the next morning and be on European time. I decided to walk all the way downtown from the Messe – which turned out to be about a 20 minute walk. There are a bunch of nice trendy shops of the Ruettenscheidstrasse which I’ve never seen before as I generally traverse the route on the U-bahn. Walked around the downtown area – according to Google maps – probably almost 12km total. Looked in the local stores, hoping to find some newer games to start my trip off with. However, it seems that the gaming areas in the local stores are growing a bit smaller. In both the Galeria Kaufhof as well as the Toys’R’Us here, the boardgame section seems to be shrinking with each passing year. 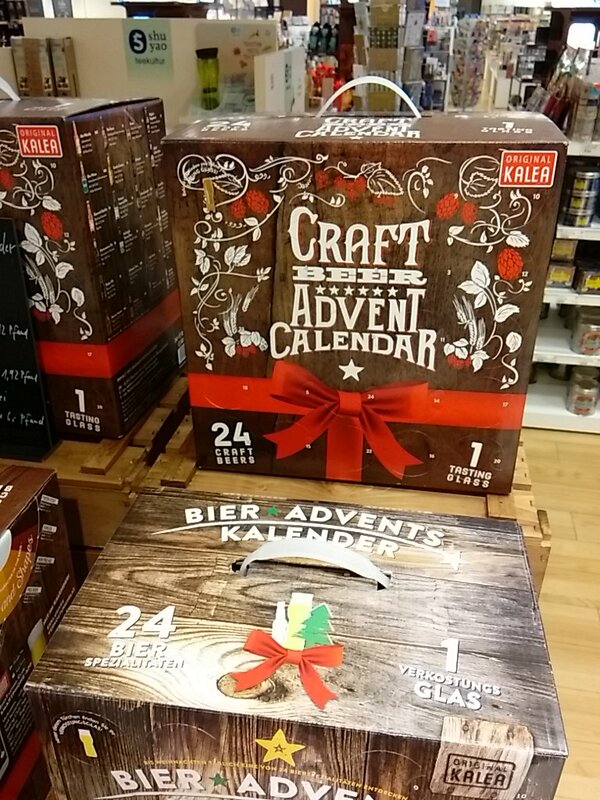 For those of you who have not been here, Advent calendars are a huge thing here – the stores are filled with dozens of different varieties. Dinner that first night was a treat… One of my favorite German meals is their interpretation of fast-food lo mein, with duck served on top. When I’m in Munich – there are a few favorite places that I always go to. 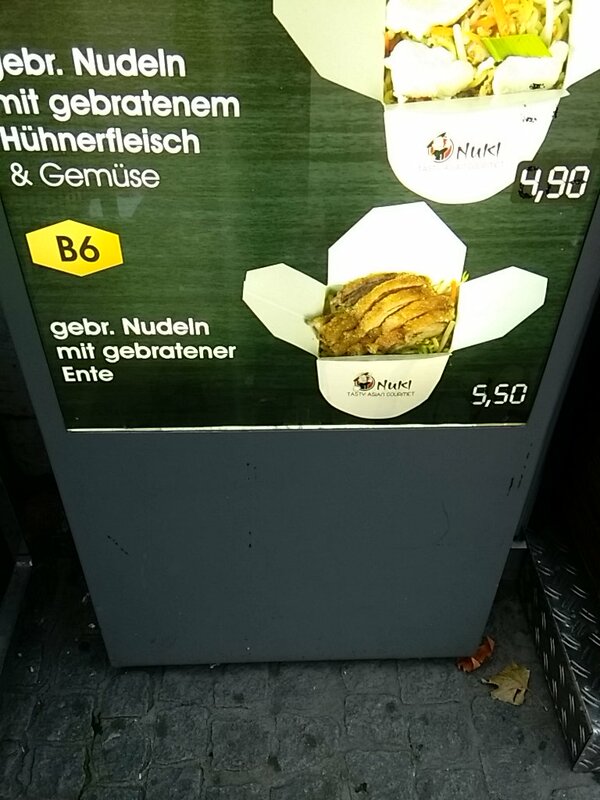 However, in Essen, I could never find a place that had duck – at least not in my usual haunts… But now, I have my spot downtown. I managed to go there three times during the six days I was here. 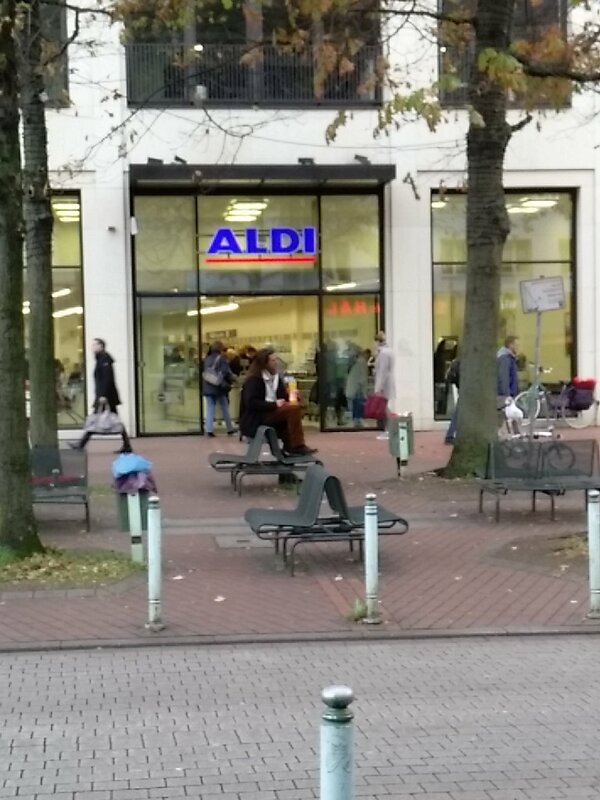 On the way back, I coudn’t help but stop in the ALDI (a German grocery chain) – we’ve become big fans of the ALDI stores in the US. Found out that they are known for this cheap wine prices here (just like at home). 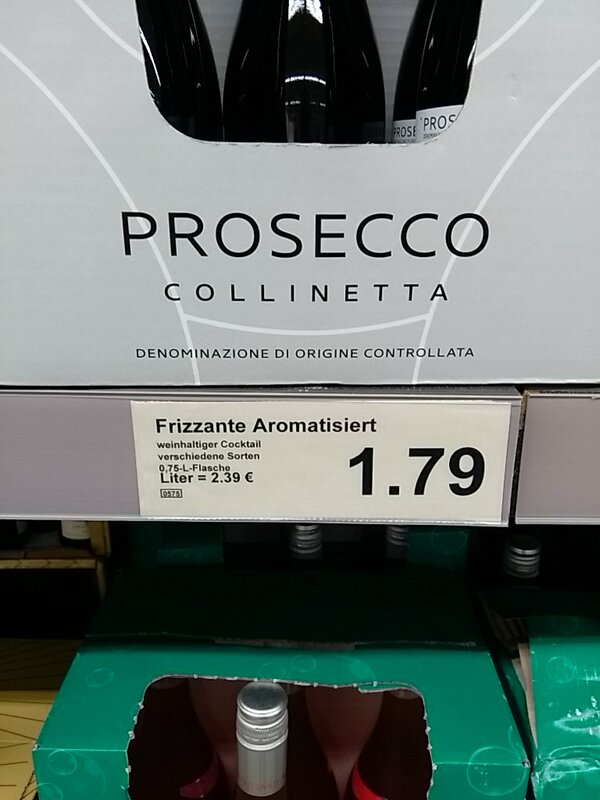 The only other thing of note at the grocery store was something called “Cocktail Salami”. They are like little pink nuggets of fatty goodness. 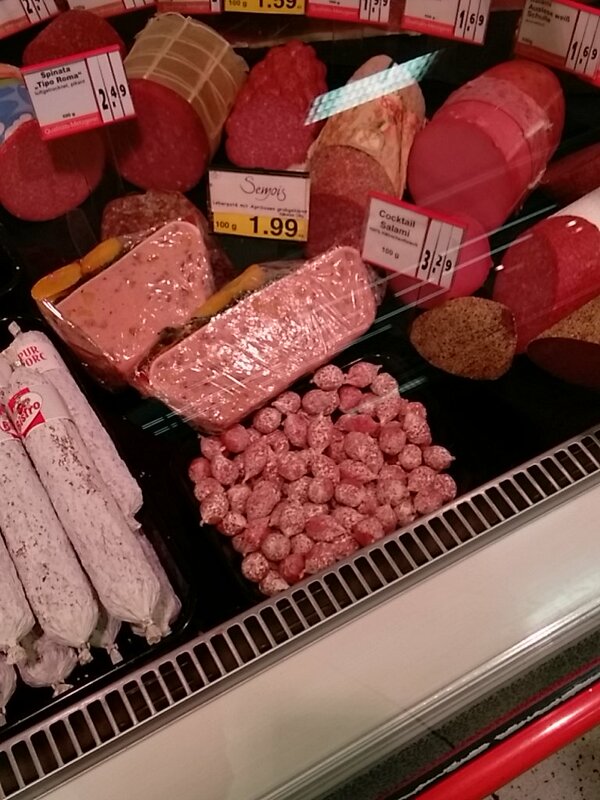 The nice butcher behind the counter let me try one, and as you might expect, it tastes just like salami. But in a much funner package. Tuesday was fairly uneventful. My brother got in early that morning, and we then started to do the same walk-around-town-like-a-zombie-so-I-don’t-fall-asleep routine. We meandered back into town, saw some friends who live around here and also went to wander though the halls. Tuesday is a bit early for setup for the smaller booths; but many of the larger productions were well into construction by that time. I spent a bit of time with my BGG friends. The amount of technical work and troubleshooting that it takes those guys to set up and tear down for each show is amazing. And, since they don’t want to risk stuff being stolen, much of it must be taken down and put behind locked doors each night meaning that they have to do lots of setup again on the next morning. My role in helping the booth set up was to help start the live stream. I managed to get onto for a bit to test out the settings and played a game of The Game Extreme with fellow OG-writer W. Eric Martin. We managed to get a score of 17 which might be my best score ever (I am remarkably bad at the game). Eric probably would have won with a better partner. But, good times were had by all, and we proved that people could laugh at our bad play as it streamed online. Japon Brand (and a number of other booths) were in a bit of a panic. A bunch of games were caught up in customs. Apparently there was a new regulation put in place for this year’s fare. 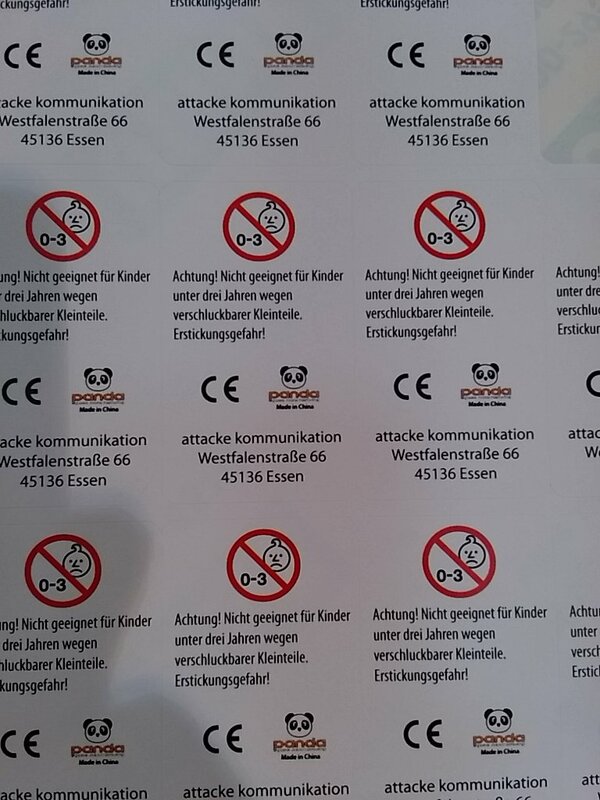 The exhibitors had all been warned that all new games sold at the show much have the “CE warning” on the box, and it must be printed in the German language. If this was not already on the product, games might be held at customs or they might be confiscated off the floor. The Japanese games were stuck in customs limbo as were the games from Renegade. Well, of course, it’s not like you could send back the boxes to be reprinted. The solution was to place a sticker on the shrinkwrap in the correct place. Walking around the halls, you could see plenty of sticker sheets that looked like this. We also talked to the Eggertspiele guys. They seem to be happy with the transition to Plan B. Looks like they will be busy doing development for plan B (as evidenced by their work on Azul); though they will still be looking for gamers’ games for the eggertspiele imprint. At least for the foreseeable future, there will still be an eggertspiele booth at the show. Excitingly, I tweeted my first thing in about five years. I don’t think I screwed anything up. 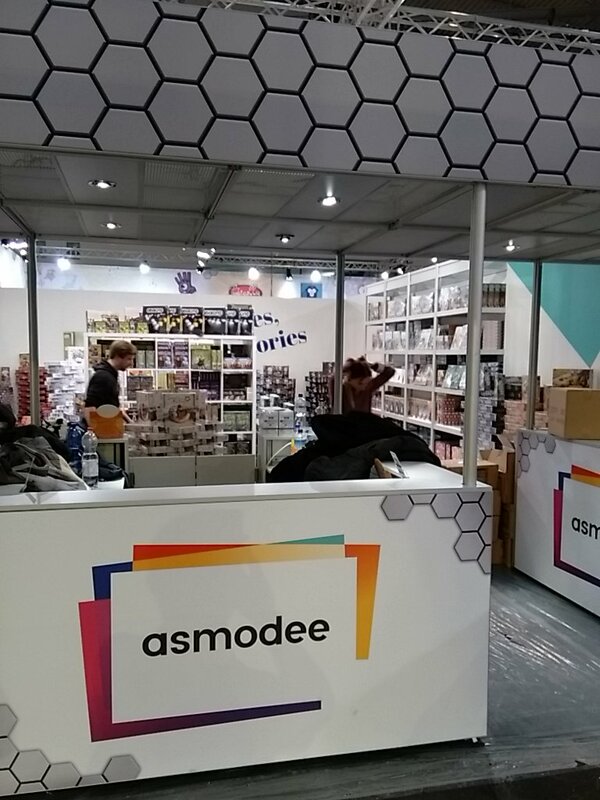 About the only other thing that I remember seeing that day which surprised me was the new Asmodee logo. I don’t really remember seeing this prior to that day. Not as inspiring as the laughing pink guy from before – but hey, I’m not in marketing so I realize that I don’t get these sorts of things. In any event, no games were acquired Tuesday. The only thing I got was a food baby. 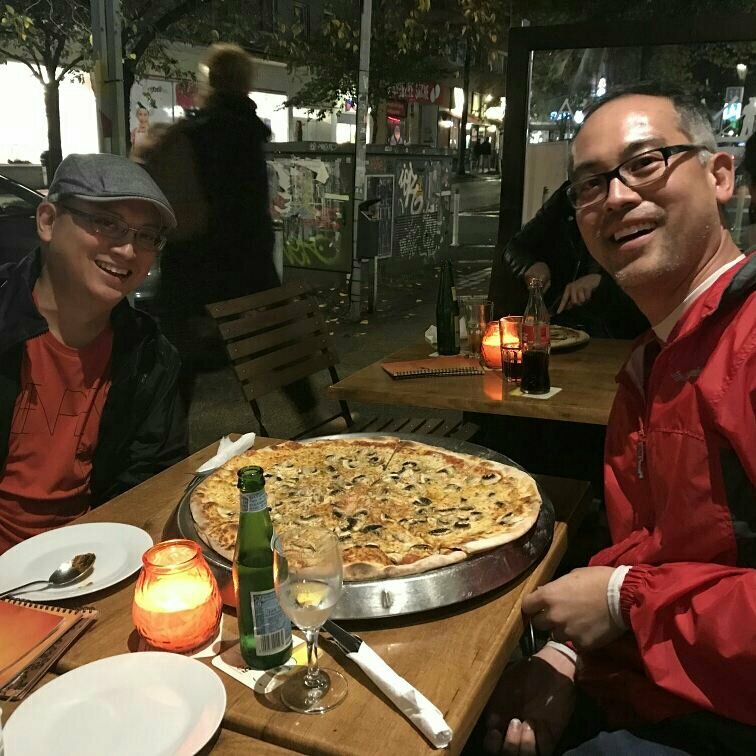 We went to one of our favorite pizza places, and I was starving – having walked another 20-22 km during the day. I was pretty hungry, and I knew that I was wanting to eat more than the medium pizza – and I knew how big it was because we come to this place nearly every year. Anyways, I ordered a large pizza, and had to confirm that I wanted the large on no less than 3 occasions during the ordering process. 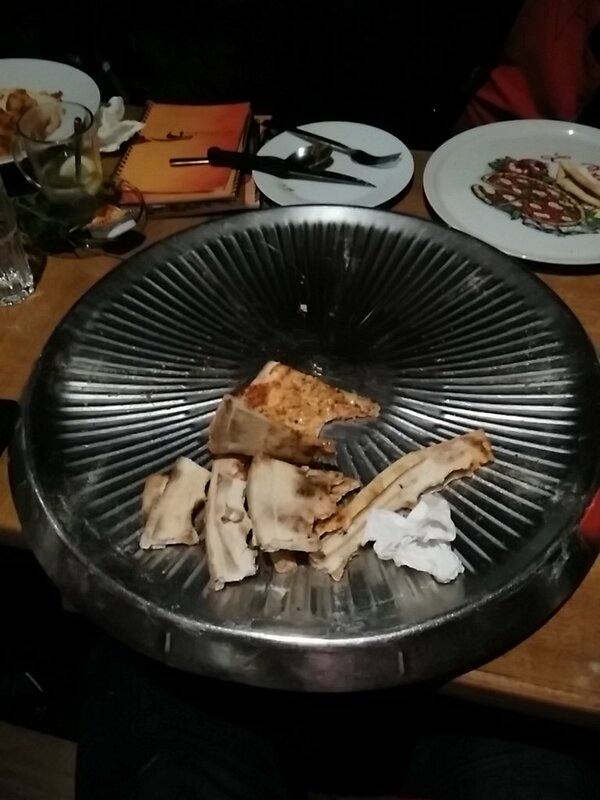 But, I’m happy to say, and much to our server’s chagrin, the pizza was mostly consumed before we left. And, with that, the start of the trip has been chronicled. Almost nothing about games yet, but that’s what happens on the first days of all my Essen trips. Sleep, eat, etc. I’m about the get on my plane home now, so I’ll stop here and try to pick up the story while I’m crossing the Atlantic. Coming up next – Wednesday – the real setup day! 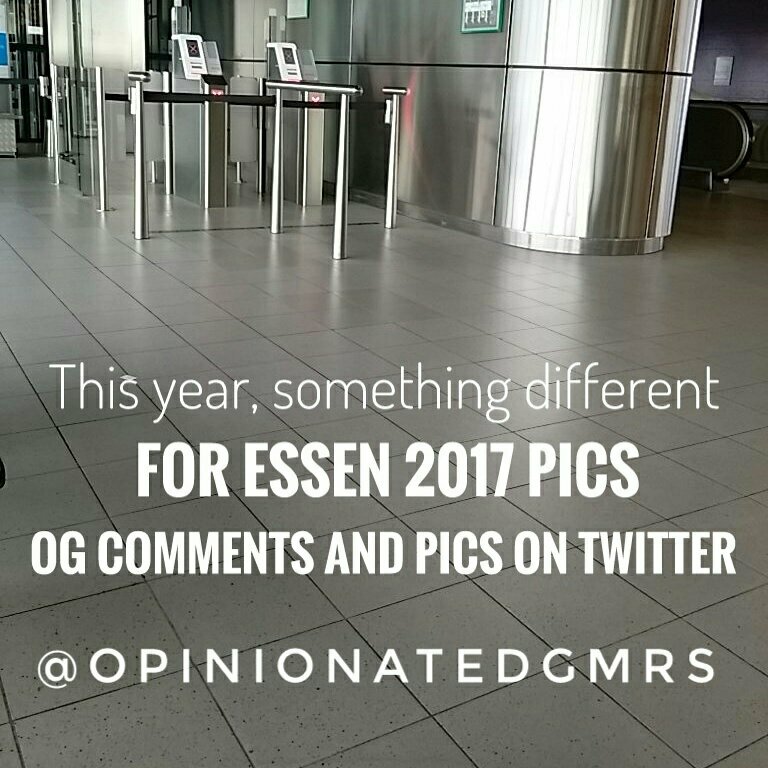 This entry was posted in Essen 2017. Bookmark the permalink. Love the start to the recap. Was great to follow on Twitter this year too. Wish we could have caught up! I had over a dozen appointments to pitch my games over the four-day conference… but I’m glad you had a blast.